Finally getting this up! I had to watch the last episode of Lost, so I was a bit distracted! 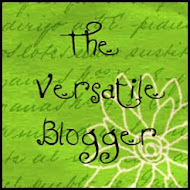 I got this idea from a book called Flip, Spin & Play which is for cool scrapbook elements. I thought that this could be adapted to a card. The 4 pictures in the book was a pretty bad presentation of the technique and most people probably couldn't figure it out. I spent a lot of time just looking at the finished product to figure out how the mechanism even worked! But the good news is, it's rather easy to make, once you figure it out. 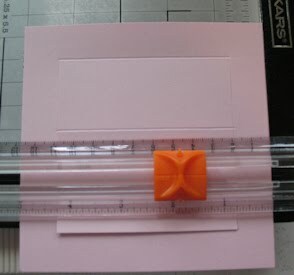 2) Using the Fiskars paper cutter, line up the 5" piece of cardstock at the 3/4" mark on the RIGHT side of the cutting rail. Lift the cutting rail and position your blade at 3/4" on the rail. Lower the rail and pull the blade to the 4 1/4" mark. 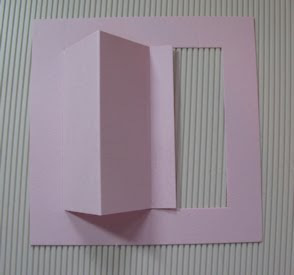 Turn the cardstock clockwise to another side and follow the same steps. Turn the cardstock clockwise again, and follow the same steps. At this point, you will have 3 cut sides. 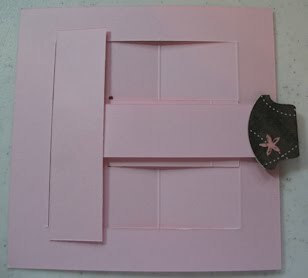 3) Place the piece onto a scoring board (or use a ruler and a scoring tool). At the 3/4" mark, score from one cut line to another cut line as shown above. 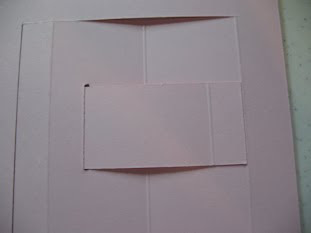 4) Keeping the cardstock in place, score at 2 1/4" from one cut line to another. Score at 3 3/4" from one cut line to another. 5) Place the piece back onto the Fiskars cutter. Line up the left side at the 3 1/4" mark. Lift the rail on the cutter and position the blade at the 1 7/8" mark on the rail. Drag the blade to the 3 1/8" mark. Move the cardstock a little and cut another line right next to the first. Cut the small slot of paper away. 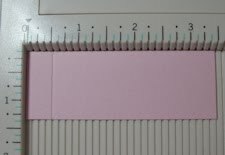 6) Score at 1/2" on the 3 1/2 x 1 1/4" strip (This is the piece that will "hover" at the center of the card). Add some strong adhesive (like stricky strip) to the 1/2" scored end. Stamp your greeting on the strip. Try to keep it closer to the end with the score so that the greeting doesn't peek out when the slide mechanism is closed. 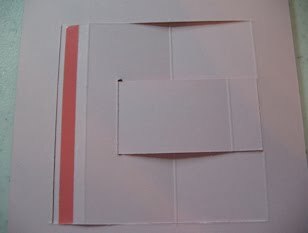 7) Slide the above piece into the slot as shown below and secure with the sticky strip at the center of the score mark. The first picture is the front side of the card. The second picture is the backside when you flip it over. 8) Create the T slider by placing the 4" x 1" strip at the top and glue the 4 1/4" x 1" strip at the center as shown. 9) Place a line of sticky strip along the 1/2" scored mark as shown. 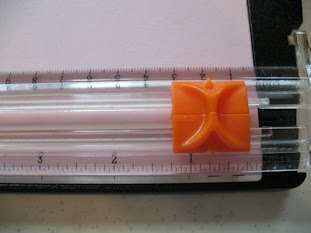 10) Attach the T slider to the sticky strip as shown. Center the slider so that 1/4" extends on each end of the 1/2" Scored piece as shown. 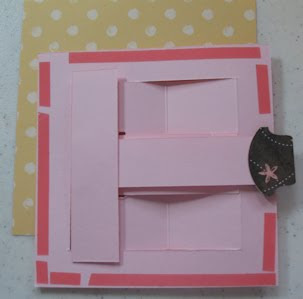 Add a tab, circle punch, scallop punch (as shown in finished card), etc. to the end of the T slider so you can easily grab and pull. You could also tie on a ribbon. If you want to stamp a greeting on the T slide, I recommend waiting until after the card is assembled. Pull out the T slide and then stamp your greeting. It's the best way to make sure the whole greeting shows in the proper place. 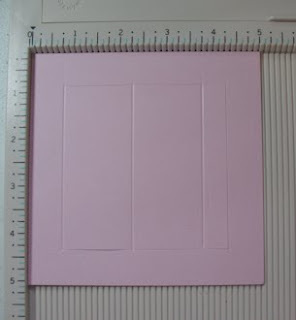 11) Apply sticky strip all around the outer edge of the 5 x 5 piece. 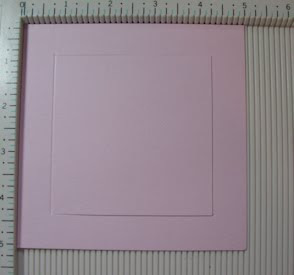 You need to use a strong adhesive to keep the card firmly in place. Be sure to leave a little space on each side of the T slide piece for your pull tab. EDIT: The tab has a tendency to stick against the edge of the paper when sliding back into place. 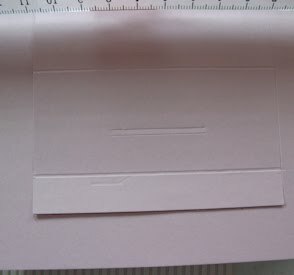 To avoid this, put a pop dot or thin dimensional on each side of the tab to create a little "clearance" for the tab to slide back into the card (this step is not shown in the picture). Apply to your card base. You could cut the cardstock at 5 x 10 or make it larger for a small border. In the sample, I cut the polkadot paper to 5 1/4 x 5 1/4 and then taped to a card base 5 1/2 x 5 1/2"
I stamped the flower from A Good Egg stamp set (SU!) with Pretty in Pink ink pad and then use a glue pen and dazzling diamonds glitter to add highlights to some of the flowers and dots. Tied on vanilla satin ribbon. The cute little inchie bears are by Rubbernecker Stamps. Colored with copic markers. Popped with dimensionals. 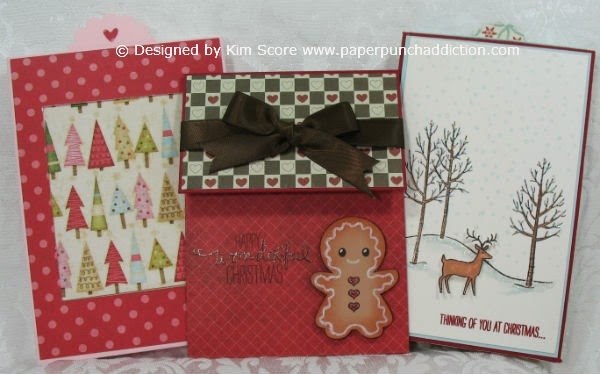 The greetings are from Small Sayings and the Hugs & Wishes stamp sets (SU!). For those of you that are curious, the polkadot paper is from the old retired Spring Flowers double sided DSP by Stampin' Up! 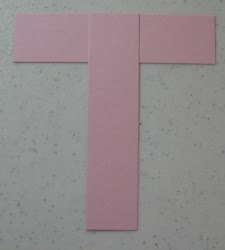 For a cool variation on the standard T-Slide, check out my Triple T-Slide Card. For an A2 Cutting Diagram and instructions, go Here. tku for your tutorial, I have the book and didn't understand it either. Guess I needed an engineer degree, haha! Tks for sharing! Thank you for this awesome tutorial! I have family in town but will def. try this once they leave! This is the first time I have card like this. I love anything that flips, spins and folds. Your tutorial is great! So easy to understand. Very well done. Thanks so much. 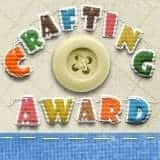 Kim, I am sending a huge thank you to you for making this tutorial! I was eying with this book since ages and now I think it is so cool if it has stuff like this in it - guess I need it. I had to try that t-slider card right away and your tutorial is so easy to follow. 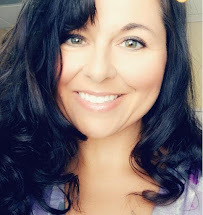 If you want to see my version of it feel free to click here. Thank you so much for taking the time to make this tutorial! Your directions and pictures make it so clear and very easy to understand. step and it worked perfectly! Thanks for the tute. I have instructions for the pop up idea, but I love how you have changed it with the little peak a boo piece. Thank you for a great tutorial; sure makes it easier to understand with those step-by-step pics and info. 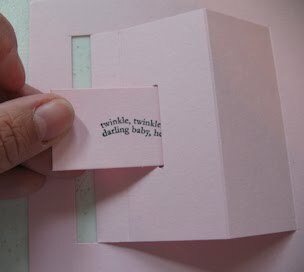 Fabulous card and awesome tutorial! I love the way the slider works. 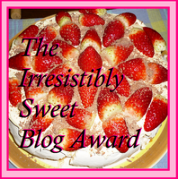 Thank you for linking to this in the TLC thread today. I did manage from the tutorial in resources, but it's SO much eaiser seeing the score and cutting lines on the plain white card. I tend to use just a cutting mat, ruler and knife, so it's nice to see the layout rather than be working strictly from measurements. As for the triple one - definitely going to give that a go!! 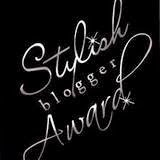 Thank u sooo much for the tutorial.. i was looking for it all over the net and then found this blog... im definitely going to follow ur blog.. great work... keep it up..